Screws with holes across their heads. SPECIALIST fasteners have always been a strength of the Reliance Gear Company , and its engineers have been working on innovative products which are now introduced to the market in a new brochure. The new range includes screws designed for wire-locking with holes across their heads, for high reliability, mechanically fastened screw retention. This special design prevents the fastener unlocking in high vibration environments, and can be used in conjunction with thread locking compounds. It also provides a visual check that the screws are fully fastened. 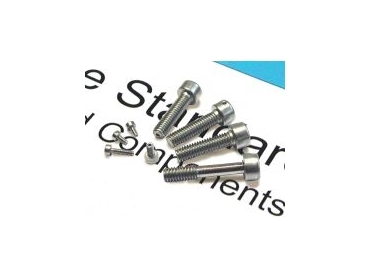 The screws are ideal for use in aerospace applications which include safety critical assemblies. For engineers working with high vacuum applications, Reliance has developed screws with through holes along their axes. These are designed to allow assemblies to "breathe" where required, and can be used in high vacuum sub-assemblies to improve evacuation of air from blind tapped holes and cavities. They offer a solution to trapped volumes by providing a leakage path, yet are designed with minimum through hole diameters to ensure maximum strength is retained. The brochure also includes new captive screws. When used in conjunction with correctly designed components, these screws remain attached to removable covers and lids. This is particularly useful for limited access situations, where screws may drop out and be lost or cause damage. The screws are also ideal for use in gearbox inspection covers and removable sub-assemblies, and have specially machined radii to prevent stress raisers. All the above screws are manufactured from A4-70 cold worked austenitic stainless steel, certified to a minimum of 700MPa tensile strength, while providing the best possible corrosion resistance. Smaller sizes are available in A2-70 stainless steel. All fasteners complement Reliance engineered components and assemblies and are offered to provide a single source for complete kits of parts.